Seed shattering is an important trait related to the efficiency of harvesting seeds in crops. 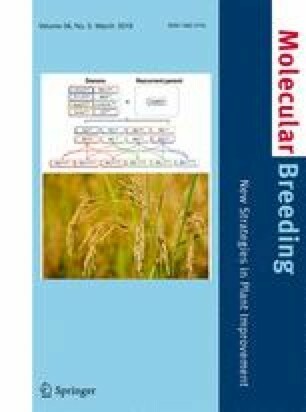 Although several genes have been identified to control seed shattering in rice (Oryza sativa L.), the genetic architecture underlying extensive variation of seed shattering is yet unclear. ‘Oonari’, a moderate-shattering indica rice cultivar, was developed from a mutant obtained through gamma-ray irradiation of an easy-shattering cultivar ‘Takanari’. The grain pedicel of ‘Oonari’ showed greater resistance to bending than that of ‘Takanari’, while there were no obvious differences in resistance to pulling and abscission zone formation. Investigation of the seed shattering of an F2 population from a cross between ‘Takanari’ and ‘Oonari’ indicated a single semi-dominant locus responsible for seed shattering, which was designated as Sh13. We used bulked DNA of F3 lines with the same shattering degree as that of ‘Oonari’ and DNAs of their parents for whole-genome sequencing, localizing Sh13 at the terminal region on the long arm of chromosome 2. In the candidate genomic region of ‘Oonari’, we identified a tandem duplicated segment containing a microRNA gene, osa-mir172d, whose wheat ortholog is involved in controlling grain threshability. Quantitative RT-PCR analysis indicated that the relative expression of osa-mir172d in ‘Oonari’ was twofold higher than that in ‘Takanari’. We suppose that the duplication of osa-mir172d be involved in reducing seed shattering in ‘Oonari’. The online version of this article ( https://doi.org/10.1007/s11032-019-0941-3) contains supplementary material, which is available to authorized users. We gratefully acknowledge the Advanced Analysis Center of NARO for use of high-speed processor system, Prof. Takeshi Nishio for valuable revision and comments, Mrs. Sayaka Niwa and Mrs. Kanako Matsumoto for experiment support, and Mr. Masayoshi Tobita for field support. This work was supported by Cabinet Office, Government of Japan, Cross-ministerial Strategic Innovation Promotion Program (SIP), “Technologies for creating next-generation agriculture, forestry and fisheries” (funding agency: Bio-oriented Technology Research Advancement Institution, NARO).